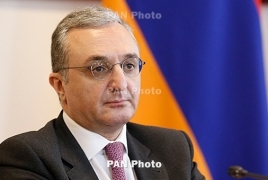 PanARMENIAN.Net - At a gathering of the leadership of the Armenian Armed Forces in the administrative complex of the Ministry of Defense, the head of the Armenian Foreign Ministry Zohrab Mnatsakanyan delivered a lecture. Weighing in on the Karabakh conflict, Mnatsakanyan reaffirmed that there is no alternative to the peace process. Top officials of the Armenian Armed Forces werebriefed on the approaches and principled position of Armenia in the process of the peaceful settlement of the Karabakh conflict, as well as the most important signals and factors that can play a role in the matter.